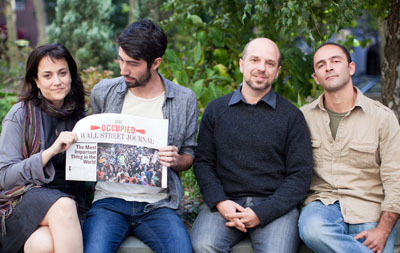 Michael Levitin (Cowell, '98, history), right, with fellow Occupied Wall Street Journal editors from left, Priscilla Grim, Ryan Wood, and Jed Brandt. Michael Levitin's recent article on the Occupied Wall Street Journal web site. 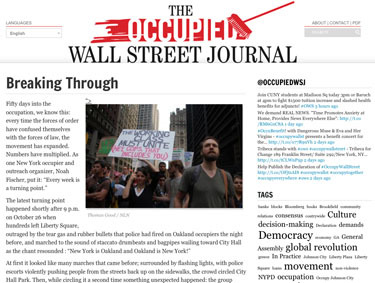 "Media is more important than ever as the movement moves indoors for winter," said Michael Levitin (Cowell, '98, history) by phone from New York where he has been involved with the occupy movement since its early days more than two months ago. Levitin, 35, a freelance journalist, has helped pull together five issues of the Occupied Wall Street Journal, a printed newspaper and web site that chronicles the occupy movement. "It speaks to a growing national movement," he said. "It gives voice to the occupation." Articles range from think pieces from well-known authors to on-the-ground reporting on issues affecting the occupations. "We're still cranking out our paper," Levitin said this week. A national edition is being printed in Seattle, Chicago, and Houston. More than 100,000 copies have been distributed in New York already. Another edition is in the works with publication expected early next month. Last week, police rousted encampments in cities across the U.S., including New York, Atlanta, Portland, Oakland, Berkeley, and Davis. The Occupy Wall Street protest was just beginning in late September when Levitin was passing through New York on his way back to Berlin after spending the summer in the United States working on a film about global warming. He visited Zuccotti Park to witness the burgeoning occupation and quickly decided his plans could be postponed. "What was developing was profound," he said. "This is not a protest, this is something much more serious," he said, recalling his thoughts at the time, and decided to get involved. Levitin soon connected with others starting a fledging newspaper and put his journalism skills to work helping edit the first issue. "As a writer, as a journalist it made sense to make a paper," he said. The first issue of 50,000 copies was quickly snapped up. The first two issues were translated into Spanish and distributed to New York's boroughs. After UCSC, Levitin covered water protests in Bolivia in 2000 for the English-language Bolivian Times, later becoming its editor. He earned a masters degree in 2002 from the Graduate School of Journalism at Columbia University and was founding editor of the Prague Literary Review. He also reported from Puerto Rico for the Associated Press and has written freelance articles for several national and international publications. Levitin credits UCSC with helping create his personal and professional direction of activism and journalism. He wrote his first published piece for Santa Cruz resident and former UCSC graduate student Stephen Kessler's Redwood Coast Review and remembers UCSC well as being a place for students who "want to do more, be more creative, more self-directed."